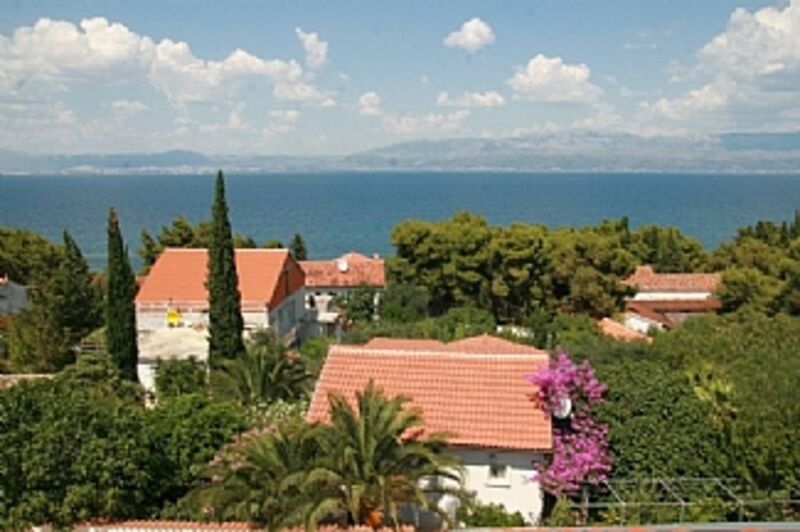 Located in the beautiful fishing village of Sutivan, this spacious, fully equipped duplex apartment is 200m from the beach and within short walking distance of all local shops and amenities. The small development enjoys stunning sea views and has the benefit of a sun terrace and private parking. The apartment is fully equipped for a family holiday and has its own BBQ area, balconies, air conditioning, internet access and satellite TV. I am a commercial finance broker specialising in real estate. Born in Manchester, I live and work in London. Having been a regular visitor to Croatia since 2000, I eventually decided to buy my own holiday home in the country. Brac was a natural choice owing to the beauty and tranquility of the island and its proximity to Split, neighbouring islands and the Dalmatian Riviera. Sutivan is a beautiful, unspoiled village which boasts a charming harbour, stunning views, attractive beaches and a lively choice of shops, bars and restaurants. The village is a short drive to the ferry port at Supetar and all the major island attractions are easily accessible. Lively in summer, Sutivan nevertheless retains a graceful charm and a family friendly atmosphere. Sutivan offers a complete contrast from the noise and bustle of the big city. Within a few days, you will be feeling relaxed and revitalized. You will be struck first by the wonderful location; close to the beach and with panoramic views of the lovely Dalmatian coast. The short walk into the village allows a sense of seclusion, yet restaurants, bars and amenities are only minutes away. The development has a private sun deck and the apartment has its own BBQ area and sun terrace, giving you privacy and space to relax. The two storey duplex design and two bathrooms provide the sense of a much larger property. Furnished to very high standards, the apartment is light, airy and has been fitted out with all modern conveniences, including air conditioning, WiFi and satellite TV. Upstairs bathroom with bath/shower, WC, bidet and washbasin. Downstairs WC and hand basin. Open plan lounge/dining room with balcony and sea/mountain views. Furnished to very high standards with sofa, dining table (seats 6), armchair, coffee table. TV, DVD, Stereo music player, WiFi. Air conditioning. Modern open plan kitchen area fitted with cooker, hob, fridge/freezer, microwave, washing machine, dish washer, kettle and iron. Notes on accommodation: Living area has air conditioning/heating. Bedroom 1 has air conditioning/heating and Bedroom 2 has electric fan. Outside: The development is set within its own gardens and a sun terrace. The apartment has two sea facing balconies and a private BBQ area. Sun loungers are provided. Cleaning / Towels / Linen / Maid service: Towels and linen included. Weekly cleaning and linen exchange. Other: Storage room with plentiful space for suitcases. Equipped with BBQ grill, sun loungers, garden table and chairs. Lovely quiet location with great views after a bit of a climb! The property is reasonably furnished, but outside furniture a little tired. The walk up to the property is steep so a car would be vital for the unfit. That said, the views are super from the balcony. Housekeeper very helpful, and owners contact very reassuring prior to arrival. Cannot recommend the village enough. Fabulous people, a variety of restaurants and a stunning cove to swim in. If they ever fill the pool it would be fab to cool off in after the hill climb! Thanks for your review and I'm delighted that you enjoyed your stay in the apartment and in beautiful Sutivan. We have ordered new sun loungers etc for next season. The 150 meter walk from the beach is a little exerting but as you say, well worth it for the sea and mountain views. This was a really top class apartment. There was a spacious ground floor living area with everything you needed for self catering for a few days provided. The balcony had an impressive view back over Split. The master bedroom (which we used) was tall and airy, with another beautiful balcony off a mezzanine level. It was air conditioned downstairs and in the master bedroom. It's a comfortable walk into the village of Sutivan where we found some great places to eat, drink and read our books. A beach is at the immediate bottom of the drive, which is a steep but relatively short hill. Would definitely book again if returning to this part of Brac. Thank you for your review and I'm delighted you enjoyed your stay. Come back and visit us again. Thanks for your kind review and I am glad you enjoyed your stay. We hope to have the pool back in action next summer. This apartment is immaculate, well maintained and elegant. It has every necessary amenity including airconditioning and is quiet, private and a three minute walk from the beach. The property has a secluded barbeque and sun lounge area, two lovely balconies with gorgeous views and very comfortable beds and furniture. The owners are a charming English couple who clearly have good taste and have kept the property to an exacting standard. They provided us with some excellent restaurant recommendations in walking distance -(try the fresh line fish at Dora in Sutivan) - as well as around the island of Brac. I would definitely recommend sampling the 'bingo' cake at Konoba Toni in Dol. The apartment is located 200m from a pebble bathing beach, where you can sunbathe, swim in beautiful clear water and enjoy stunning views of the Dalmatian coastline. Fly to Split airport, drive to the city's port and take a 45 minute ferry to Brac (Supetar). Sutivan is a 15 minute drive from Supetar and can also be reached by bus and taxi. Car hire is recommended. 2 minutes walk to beach, 10 minutes walk to shops and bars of Sutivan, 15 minutes drive to ferry port at Supetar. All major sites on Brac are within easy driving distance. Sutivan is a Dalmatian fishing village characterised by stone houses, shady palm trees and an ancient church overlooking the harbour. There are three supermarkets, a bakery and any number of lively bars and restaurants. It is possible to hire boats in the harbour and to book most water sports eg scuba, windsurfing, canoeing, waterskiing and jet skis. Walks, mountain biking and climbing trips are also available. The town is well served by public transport. Booking Notes: For further details, please contact Mike Adam. Deposit required to confirm reservation and full payment within one month of arrival. Changeover Day: Saturday changeover day preferred in high season. Notes on prices: Prices shown are for the property per night in Euros. Weekly rentals are normally Saturday to Saturday. Alternative arrangements may be possible outside high season. The apartment will usually be available from 14:00 on the day of arrival, and we ask that you vacate by 10:00 on the departure date to allow time for cleaning.